For many years I have witnessed leadership at a variety of levels at several companies struggle to see the value of certain HR practices. One practice of uncertain value from them within HR that always seems to pop up is Job Descriptions. Job descriptions should remind employees what the overall objective is for their position. Why? Because that objective should tie in to whatever the Mission and Vision of the company are. Absent a clear objective statement, both new and current employees won’t understand why it is they do what they are asked to do. That might sound a little crazy, but I have met hundreds of employees over the years who, when asked why they do what they do at work, they had no answer. I do know that when employees know the objective and why they exist in their roles, they are self-driven to exceed that objective. We are not becoming lazy as a nation; we are coming unguided! It is the greatest fallacy of the workplace that we have become merely lazy, when, in fact, it all stems from lack of leadership and experience in guiding employees to excellence. Employees should be involved in the development of their job descriptions. They should gain ownership in the process and fully understand how their position relates to others within the company, and how each position depends on the other for performance. Of course, HR can champion the process, providing the process and keeping track of the descriptions themselves. The creation of the description should be done by the employee and employee’s manager. One of the best-run companies I have had the pleasure to work with linked all the descriptions for each of their positions on a shared Local Area Network while also visually linking all employees together via an electronic organizational chart. It left no one wondering who was responsible for doing what, while reporting to whom, and why? A candidate should never be interviewed without a formal job description in hand. There is no way to assess a candidate fairly without this basic tool. High-performing companies have recruitment processes that included the revision of the job description while, at the same time, the development of relevant questions for the interview process itself. Want to inspire interest in a candidate? Give them the job description, because almost no organizations do this. When people know what it is they are required to do, it creates interest and potential ownership once they are hired. Repetition is a good thing. 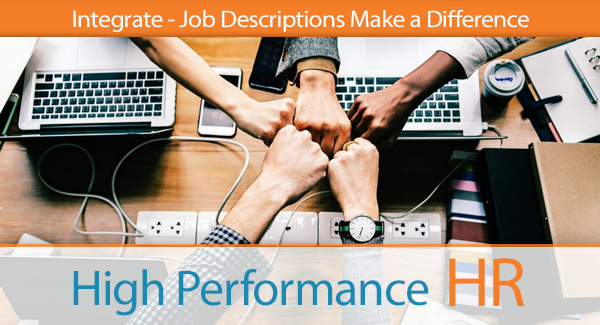 When job descriptions repeat important information that is reflected in other areas of the company, it reinforces the importance of that information. When employees see the same messages over and over from a variety of sources, and tied to several processes, it means something to them. It leaves an imprint. This is why building in language that reiterates the commitment to living up to your Company’s Mission and striving for your Vision will help get your employees going in the right direction collectively. It is also important to capture in the job description the behaviors that are required and that relate to the Values of your organization. What good and bad experiences have you had in dealing with job descriptions? Are they a waste of time from your perspective or have you witnessed employees flourish when using them? Please leave us your comments below. Thank you.